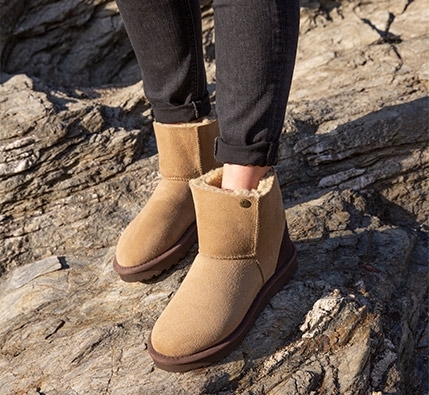 - Handmade in Newquay, all of our sheepskin boots and slippers are crafted by hand in our factory in Cornwall. - We are the only ones in Great Britain that are still crafting sheepskin footwear by hand. We use 100% premium British sheepskin, with only a small amount coming from Europe for our trims, to create long lasting and sustainable footwear. - Our sheepskin is treated so you can wash most styles. - Constructed from up to 11 elements, all our sheepskin footwear is double-stitched for exceptional durability. - We are always striving to give our customers superb products made from luxury natural yarns and fabrics, which offers durability and excellent value for money. - By working with other specialist producers, we can utilise their expertise and years of knowledge to provide our customer with top quality products, designed to last a lifetime.